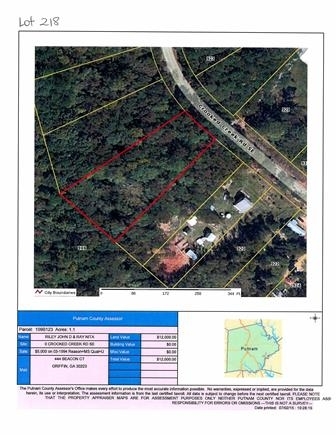 1.4 Acre Lot--Great building lot W/lake access. Mobile homes O.K. 218 CROOKED CREEK ROAD #218, Eatonton GA 31024 is a Land, with 0 bedrooms which is recently sold, it has 1 sqft, 218 sized lot, and 0 parking. A comparable Home, has 4 bedrooms and 2 baths, it was built in and is located at 198 W RIVER BEND DRIVE #198 Eatonton GA 31024 and for sale by its owner at $ 389,900. This home is located in the city of Eatonton , in zip code 31024, this Putnam County Home, it is in the OTHER Subdivision, and Bear Creek are nearby neighborhoods.